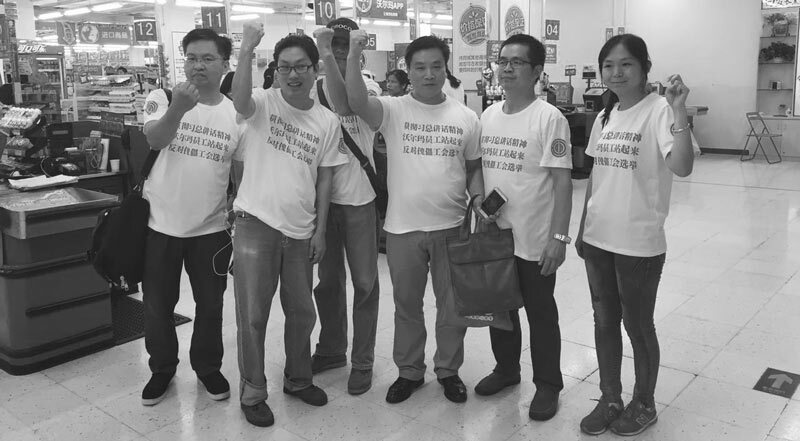 On 21 June, the Walmart Chinese Workers’ Association (WCWA) announced in its blog that it and its American counterpart, OUR Walmart (Organisation United for Respect at Walmart), had joined hands in cyberspace to discuss how to move forward in their struggle against Walmart. This marks a new stage in recent Chinese labour history. This time the news is not about a leader of the All-China Federation of Trade Unions (ACFTU), the official government trade union, shaking hands with a leader from a foreign trade union. Nor is it Han Dongfang, the well-known director of the Hong Kong-based China Labour Bulletin, shaking hands with the world’s trade union leaders. Instead, a group of workers have themselves, through persistent efforts to break through Chinese walls, finally succeeded in reaching out to co-workers overseas. This is the culmination of a number of breakthroughs in the last ten years. Walmart in China has more than four hundred stores in 169 cities, and employs around one hundred thousand people. The WCWA is an online network linking up a large number of these Walmart employees across the country. It was set up in 2014 by several Walmart workers headed by Zhang Jun, a forty-year-old electrician then employed at a Walmart store in Yantai City, Shandong Province. These core members’ original intention was to create a platform where Walmart workers could exchange experiences, air grievances, and provide moral support to each other. Work conditions and wages at Walmart have been sliding dramatically in recent years, to such an extent that today front line workers’ monthly take-home pay is often lower than the Chinese legal minimum wage. Zhang Jun was involved in union organising before he arrived at Walmart. In fact, he had helped organise the first democratically-elected workplace union born out of a strike. The year was 2006. A group of sixty women workers in a small Danish electronics company named Ole Wolff felt aggrieved at their work conditions and agitated to set up their own union. Zhang was then a worker in a factory nearby and became their legal consultant. They struggled for four years against management and the district-level trade union to keep their union going. At one point, Zhang was exchanging texts with one of the ACFTU’s deputy chairs, who flew to Shandong to personally instruct the provincial union to recognise the striking Ole Wolff union. The fight ended when Ole Wolff deliberately relocated the factory to South China. Zhang lost his own job and became a Walmart worker in his neighbourhood. The emergence of the WCWA can be traced back to 2006. At that time, Andy Stern, the president of the Service Employees International Union (SEIU), the biggest union in the United States, was launching an international campaign against Walmart. He had come to China a couple of times seeking to persuade the ACFTU to join and, for its own reasons, the ACFTU was receptive. At the same time, the ACFTU was also under strong pressure from the Chinese government to contain a rising number of strikes in the country. Under such circumstances it decided to do something that had not been done since the 1950s: to organise workers. Up until that point, whenever it had wanted to set up a branch in a company, the ACFTU had gone directly to the management to establish a workplace union that managers would be able to control. This time, however, the ACFTU experimented with organising Walmart workers ‘underground’, in much the same way that American trade unions quietly seek out workers in non-unionised factories to set up unions. In less than two months, the ACFTU was able to set up about one and half dozen Walmart union branches, holding surreptitious night-time union committee elections and founding ceremonies. But after two months, the ACFTU changed its mind and signed a memorandum of understanding with Walmart which effectively allowed Walmart to set up management-controlled unions in more than one hundred stores. Since then, Walmart union branches have been staffed by human resource managers, who have signed so-called ‘collective agreements’ in the name of the workers. Yet, as of today the ACFTU still boasts of its high unionisation rate in China’s Walmart stores. Still, the initial spate of democratic elections in 2006 had unintended consequences. Workers who had participated in those elections and are still working in Walmart stores now want to get their unions back. All four of the labour activists who set up the WCWA are in their mid-forties, and in the past couple of years, when some of the workplace union branches were due for new elections, they fought to register as candidates. Walmart management, with the tacit support of the local unions, has put a variety of obstacles in their way and has even fired two of them–they are now suing the company for unfair dismissal. Zhang Jun did not run, but quit his job earlier this year. Thus three of the four activists now in charge of running the WCWA network are former, rather than current, Walmart employees. In mid-May, Walmart announced that it was going to use a ‘comprehensive working hour system’, which is very similar to American Walmart’s ‘open work hour system’ [see the brief at p. 7], allowing extreme flexibility in the allocation of work hours. Upon hearing of this plan the Chinese Walmart workers were mortified. If the system were implemented, regular work hours would have been thrown out of the window, there would be no more overtime and thus no more overtime pay which workers have been relying on to supplement the low income, and in addition they would have had to come to work anytime on call. Suddenly the number of people in the WCWA’s online groups jumped to around ten thousand. One of the WCWA’s strategies to stop Walmart’s flagrant abuse of workplace conditions was to hold the trade union responsible. The WCWA sent appeals for help to different levels of the ACFTU, including two open letters signed by a thousand workers addressed to the union headquarters. They lodged a series of complaints about Walmart’s violations of the Chinese labour law and the company’s heavy-handedness in forcing workers to sign a consent form for the new working hour system. Employers are required to collect the signatures of the employees before they can apply for official permission to use the new work hour system. Some managers, who were under intense pressure from upper levels of Walmart to get these signatures, reportedly locked some workers who refused to sign in storage rooms, and threatened them with demotion and layoffs. Other workers were inundated by management phone calls and texts, and two workers even suffered mental breakdowns due to the incessant hounding of their superiors. The fourth activist, who is still a Walmart worker, called the ACFTU Beijing office and insisted on talking to a responsible official. An official came on the phone and the worker recounted Walmart’s illegal behaviour, saying that workers wanted to re-elect their union branch heads. The official said he would look into the matter, but nothing happened. On 14 June, the Guangdong Province Federation of Trade Unions made a sudden public newspaper statement that a Walmart-style work hour system can only be used by workplaces that operate a special roster system. Retail stores are not eligible to apply, and using it is a violation of the labour law. Blatantly missing from this statement is any mention of Walmart, or of the fact that some Walmart workers are in rebellion. For a while, it seemed the workers had gained a small victory. But because the union had not taken any concrete action the announcement has not deterred Walmart from continuing to force workers to sign off on the new work hour system. Having exhausted all possible channels to stop Walmart’s coercion, workers in a Walmart store in Jiangxi province called ‘Nanchang August First Walmart Store’ ‘fired the first shot’. On 1 July, starting at seven in the morning, seventy workers, all wearing the red Walmart uniforms with a protest sign stuck on their backs, went marching up and down the store yelling slogans like ‘Boycott Walmart’s Comprehensive Working Hours System!’ and ‘Defend Our Rights to the End!’ The news of the strike immediately spread through the WCWA network. Supportive messages poured in and the Nanchang August First Store was hailed as a model store by the aggrieved Walmart workers. But still why this particular store? Indeed, for Walmart workers in China this store has a glorious past of its own that has nothing to do with Chinese history. In 2006, this was one of those stores which were able to hold a genuinely democratic union election under the ACFTU’s tutelage. An ordinary worker armed with self-taught knowledge of the labour law by the name of Gao Haitao ran as a candidate and was elected as the union chairman. He fought with Walmart management over a number of workplace issues. When Walmart issued a blanket collective agreement for all store unions to sign, Gao demanded some changes. The struggle became heated and the news passed upward to the ACFTU headquarters in Beijing. As a model of a courageous trade union chairman, Gao was invited to Beijing to meet high level union officials. But when he continued to resist to sign the collective agreement, the ACFTU abandoned him and, in the end, he was fired. This case was widely reported in the Chinese press. According to information circulated online in the WCWA network, the Nanchang store today is staffed by a sizeable number of older workers. Some of them must have fought alongside Gao ten years ago. It is perhaps not surprising then that when the campaign against the new working hour system began, it was workers in this Nanchang store who first came out to declare that none of them had signed nor would sign the consent form. On the second day of the strike, city authorities finally appeared at the store to find out what the protest was about. They then left and said that they would consider their complaints. At the time of finalizing this draft, it is still unsure whether other Walmart workers would also rise up in rebellion. Walmart employees are among the lowest paid workers in China and also globally and are therefore some the most vulnerable. If their recent struggles represent an important step forward for the Chinese labour movement, they still need strong international support to avoid losing what they have achieved thus far. 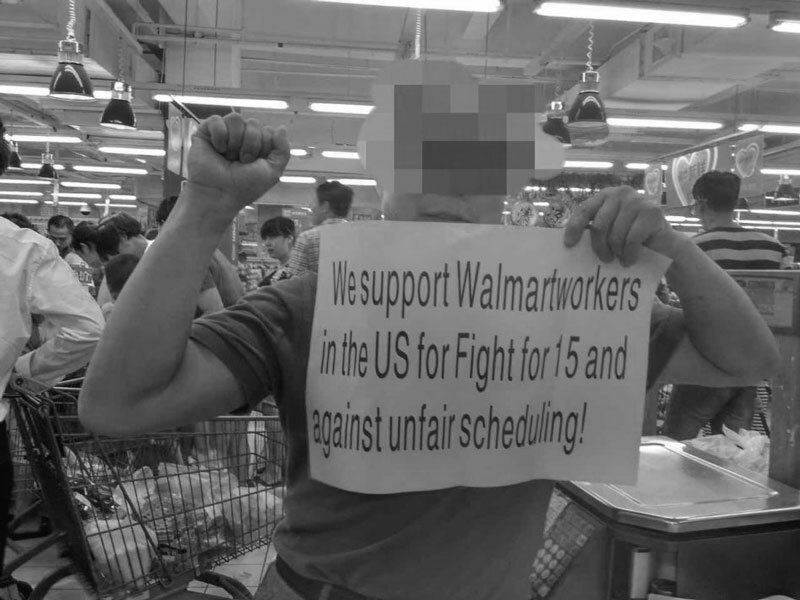 It is therefore important that global trade unions, international NGOs, and other relevant actors mobilise their networks to put pressure on Walmart headquarters in the United States and China, and ask for the support of the ACFTU leadership to make sure that the rights of this active cohort of Chinese workers are not infringed upon once again. Postscript, 4 July 2016: The latest news as of today is that one other store in Nanchang, one in Harbin, and in one in Chengdu have gone on strike. In addition to fighting their own battle, the WCWA has also launched a solidarity campaign in support of American Walmart workers’ fight for a 15 USD minimum wage. [Photo 2] A Walmart employee shows his support for the American Walmart workers’ fight for a 15 USD minimum wage.